The previous item about the Mercedes-Benz celebrations at this year’s Goodwood Festival of Speed reminded me of an article I wrote some years back (and I can’t find it now!) about a rather unique Mercedes-Benz vehicle. It was called the ‘Blue Miracle’. 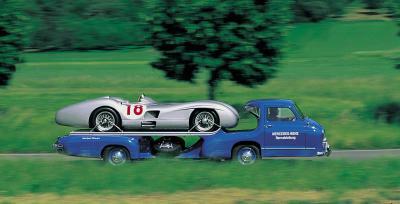 In 1954 the company built a high-speed race car transporter for its Silver Arrows which it used that year and the following year. Its sole purpose was to provide rapid transport of spare cars to the race track or damaged cars back to the plant. 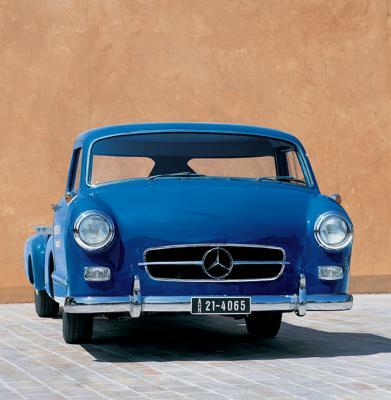 Based on a 300S saloon, the forward cab enabled a flat platform to be built behind it to carry the race cars. With a 3 litre/196 bhp engine, this 6.75 metre long machine was claimed to have a top speed of 105 mph! Sadly it was scrapped in 1967 long before folks thought of transport museums and heritage, but in 1993 the Mercedes-Benz Museum commissioned an exact replica to be built and this is it. Unfortunately, there were no drawings or specifications, so everything had to be worked out from pictures and notes that were still around. Apparently it took over 6000 man hours to build it and the machine was handed over to the Museum in 2001, but isn’t it worth it? 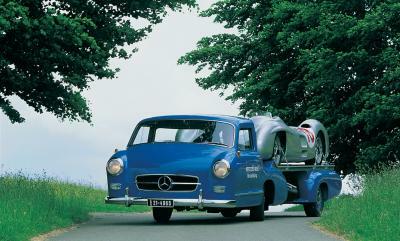 The hope is that this will be one of the surprises that Mercedes-Benz is planning for this year’s Goodwood. Fingers crossed.